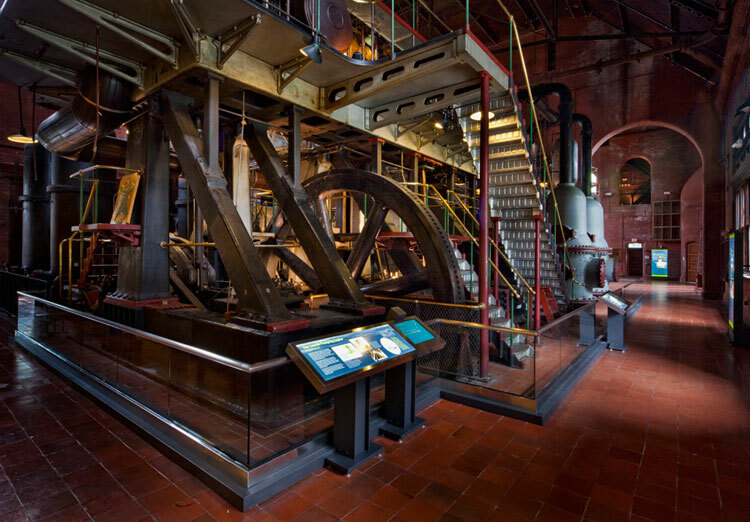 Waterworks Museum « Jeff Kennedy Associates, Inc. 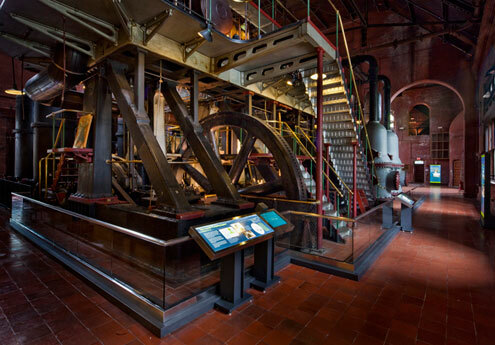 In one of Boston’s newest museums, visitors are immersed in an authentic and awe-inspiring turn-of-the-20th century workplace, the Metropolitan Water Works High Service Pumping Station. In its heyday it was the hub of the citywide water system, with a pumping capacity of 90 million gallons of water a day, and it operated continuously into the 1970s. 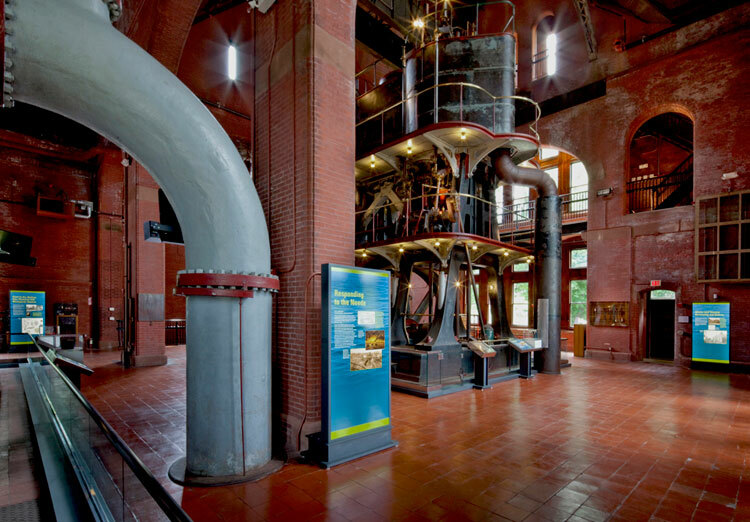 Our approach was to let visitors experience the full power of the building’s monumental architecture, engines and pumps by keeping the interpretive exhibits streamlined and unobtrusive, allowing the original feeling of this remarkable place to shine through. The project received Boston Preservation Alliance’s 2011 award for Rehabilitation of a Historic Industrial Space. 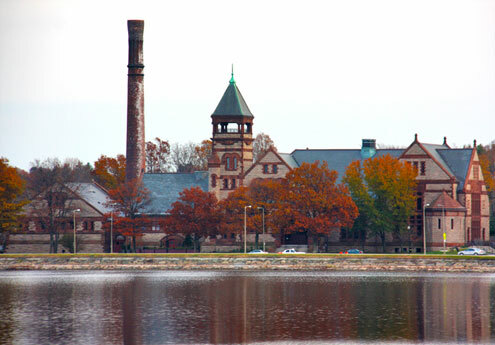 Built 1886-87 and expanded in 1897-98, this landmark building at the historic Chestnut Hill Reservoir houses three massive steam engines that pumped water to homes and businesses located at Boston’s highest elevations. 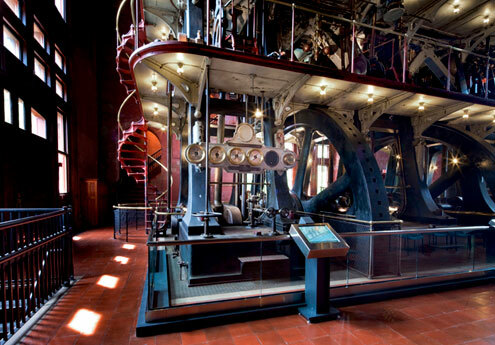 The 1973 naming of the 1894 Leavitt-Riedler Pumping Engine (foreground) as a National Historic Mechanical Engineering Landmark by the American Society of Mechanical Engineers was instrumental in securing the preservation of the building and its three most significant machines. The towering 1898 Allis Engine, arguably the jewel in the museum’s crown, rests its formidable weight on massive pumps hidden beneath floor level. The Allis’s work lights were restored to operation, in keeping with our intent to recreate the original lighting conditions of the workplace. 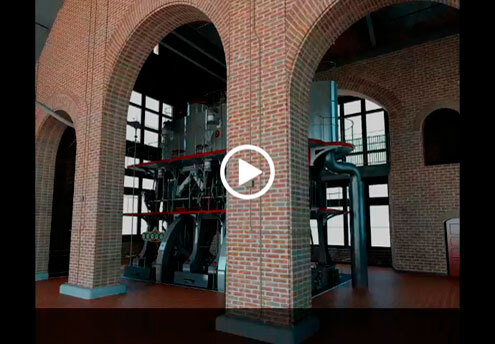 Artist John Maggard’s photorealistic 3D animation brings the inner workings of the Allis engine and its pumps to life. The museum also presents an animation of its landmark Leavitt engine. A series of freestanding LED-backlit interpretive panels are strategically located with visitor sightlines in mind, placed to distract as little as possible from the integrity of the remarkably preserved workplace and its striking architecture. 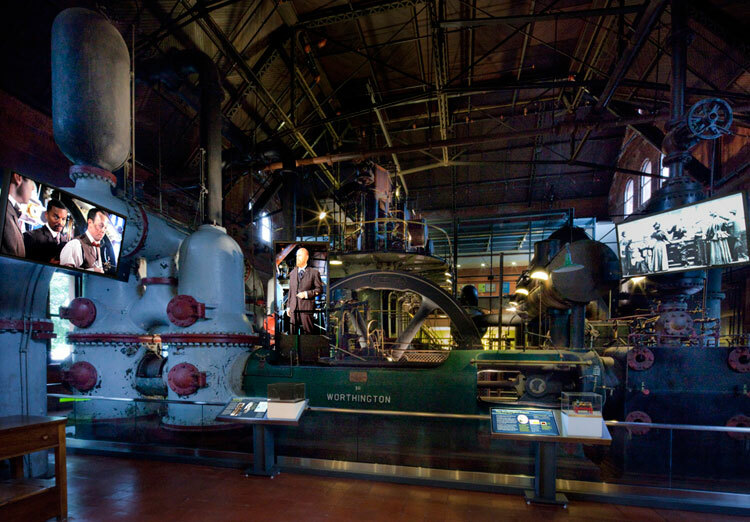 Enhancing the immersive feeling of the exhibition experience, a life-sized video character standing atop a Worthington Engine—Desmond Fitzgerald, the pumping station’s first supervising engineer—addresses museumgoers as if they are Bostonians on a behind-the-scenes tour in 1908. The museum’s signature 3-screen show is presented every half hour during times of peak visitation.